Silver Silver Ring with Green Composite Turquoise, "Green Fields in Jaipur"
A single rope of sterling silver surrounds a fascinating gemstone in its sweet embrace. 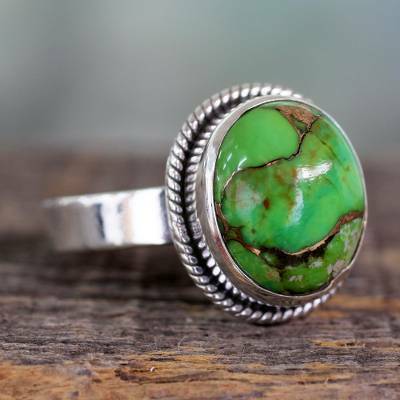 From Aparna in India, this handcrafted ring showcases composite turquoise with its wonderful green and copper tonalities. You can find sterling silver cocktail ring 'Green Fields in Jaipur' by Aparna in jewelry categories such as Turquoise Rings, Reconstituted Turquoise Rings, Silver Rings, Sterling Silver Rings, Single Stone Rings and Cocktail Rings. Enjoy exploring these sections for other Novica treasures. I love my ring wear all the time. Beautiful ring, very unique in a bold, vivid green. Received many compliments when I wore it. Its beautiful. I absolutly love it! The green is so vibrant. This ring is just beautiful. I love it. The quality is top notch. What you see is what you get. Is net, nice green and delicate. A really nice bijoux.